Seagate has announced what it's calling the world's fastest enterprise-class, solid-state drive (SSD), one that can transfer data at rates up to 10 gigabytes per second (GBps), some 6GBps faster than its previously fastest SSD. While there were no specifics with regard to the SSD's read/write rates, capacities or pricing, the company did say the new drive meets the Open Compute Project (OCP) specifications. The OCP was launched in 2011 to allow the sharing of data center designs among IT vendors -- including Facebook, Intel, Apple, and Microsoft -- as well as financial services companies such as Bank of America and Fidelity. 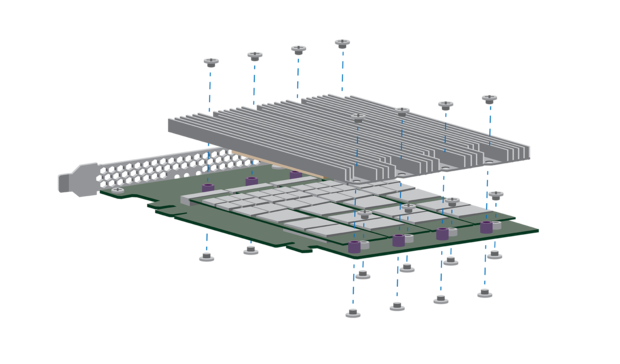 A depiction of Seagate's 10GBps, 16-lane PCIe SSD, which will go on sale this southern hemisphere winter and offer a 66 per cent increase in performance over the company's previous PCIe/NVMe drive. "Hypothetically a company like Netflix or YouTube or Hulu wants to maximize the speed at which they can deliver content, since it means they can serve more people at the same time," a Seagate spokesperson wrote in an email to Computerworld.. "Before, within a single card slot they could only get up to 6 GBps data throughput, but now in that same slot they can deliver 10 GBps. That comes to about two-thirds, or 66% increase in performance in the same slot, meaning they can theoretically deliver about 66% more streaming data per second." Seagate said it plans to display the new SSD today at the OCP Summit in San Jose. Seagate's new SSD is based on the non-volatile memory express (NVMe) interface, which was developed by a cooperative of more than 80 companies and released in March 2011. The NVMe specification defined an optimized register interface, command set and feature set for SSDs using the PCIe interface -- a high-speed serial computer expansion bus standard used in both enterprise and client systems. Intel's SSD 750 series drive, which also uses the NVMe/PCIe interface. The SSD sports read speeds of up to 2,500MB per second or 2.5GB per second. "The unit could be used in an all-flash array or as an accelerated flash tier with hard-disk drives (HDDs) for a more cost-effective hybrid storage alternative," Seagate stated in a news release about the new SSD. The NVMe specification helps reduce layers of commands found in other standards, such as serial ATA (SATA), to create a faster, simpler language among flash devices. Seagate's previously fastest SSD was the Nytro XP6500 flash accelerator card, an 8-lane PCIe SSD that had up to 4TB capacity and a maximum data transfer rate of 4GBps. The new 10GBps SSD technology accommodates 16-lane PCIe slots. Seagate is also developing a second unit for 8-lane PCIe slots, which still performs at 6.7 GBps, "and is the fastest in the eight-lane card category," Seagate said. 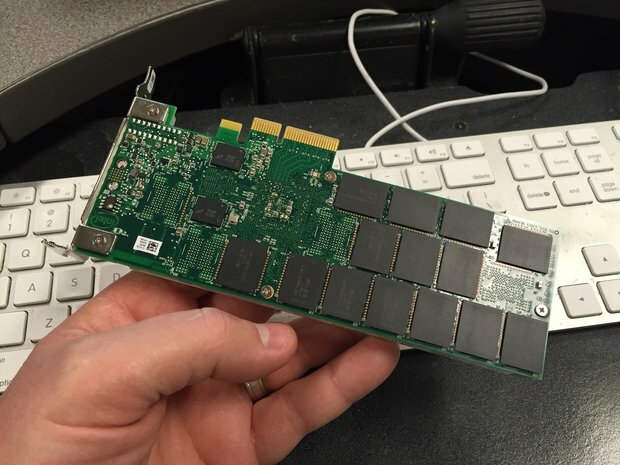 A depiction of Seagate's new 8-lane, 6.7GBps SSD. 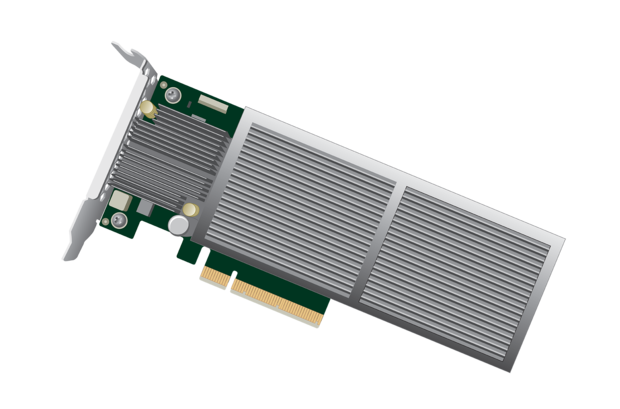 The 8-lane PCIe SSD will offer an less expensive alternative for businesses looking for the highest levels of throughput speed "but in environments limited by power usage requirements or cost," Seagate stated. Both the 16 and 8-lane SSDs have already been made available to Seagate original equipment manufacturers and are expected to be generally available this summer.